Shake your sillies out and wiggle your waggles away! Baby Beluga is going on a new adventure down by the bay! Rediscover the delightful music and hilarious lyrics of popular children's songwriter, Raffi, with songs that have entertained toddlers to grade schoolers for years. His skillful combination of rhythm, rhyme and repetition makes singing loads of fun and builds speech and listening skills! 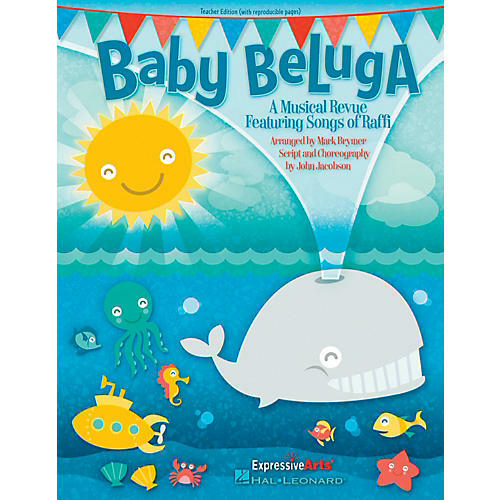 Perfect for a short program in the classroom or on stage, this 15-minute revue features five songs by Raffi, piano/vocal arrangements with simple movement suggestions, reproducible singer parts and easy-to-learn, rhyming narration that is adaptable for groups of all sizes. Available separately: Teacher Edition, Performance/Accompaniment CD, Classroom Kit (Teacher and P/A CD). Approximate Performance Time: 15 minutes. Suggested for grades K-2.